I love all the bright colors out in the stores this spring. The only trouble is that I don't want my kids to look like a big neon sign. 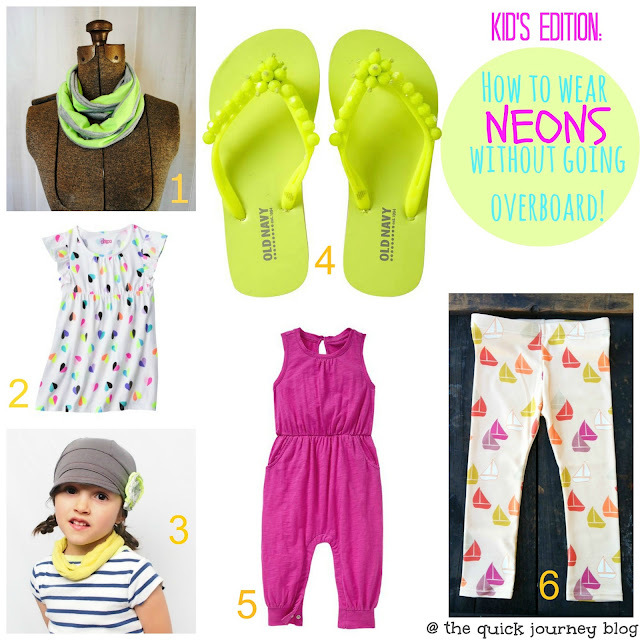 With neons, it is very easy to go overboard and look silly- even with kid's fashion. I have compiled a few options to throw in your kiddo's wardrobe to keep them on-trend, but not go overboard. If you go with a large, bold piece, then soften it with muted shades elsewhere. If you have a simple dress, you can afford to go bold with the leggings. It is all about balance. Love love love!! All of it. Following you on bloglovin! I am big into neons this year. i like this combo. How did you make that collage? such fun picks! love the boat leggings!